Every day something new is happening in the garden. I’ve promised myself a five minute scout around each morning before work, bringing me closer to the action. I can see nature starting to accelerate, fueled by every ray of sunshine and extra degree of warmth. Even the plants that are not quite off the starting blocks are showing new vitality; buds fattening or leaves a more vibrant green. Violets, brunneras and candelabra primulas are sending their first puckered leaves up through the compacted earth. Hostas lag behind, perhaps hoping to fool the slugs into believing they won’t be on the menu this year. The local fox is also on the move, disrespectful of my newly planted Narcissus ‘W.P. Milner’ and Primula vulgaris ‘Taigetos’ which he enjoys trampling, leaving behind bear-sized footprints. The goldfish are full of the joys of spring, gliding peacefully through the water one minute and splashing about skittishly the next. They are hungry too, hovering by the pond’s edge when they see me approaching and noisily vacuuming up their food. Sweeping aside a protective heap of fallen leaves this morning I exposed the tightly furled croziers of Dicksonia antarctica (soft tree fern, above and top). 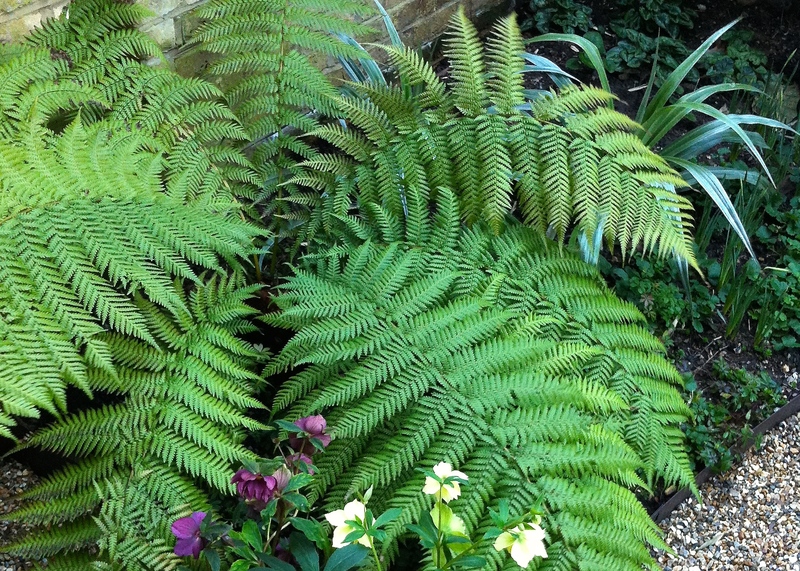 Ours is a short specimen which for the last five years has received no tender loving care; it continues to reward every season with giant, fresh, green fronds. We plan to end its loneliness this spring and find it a tall, handsome companion. The Astelia chathamica ‘Silver Shadow’, planted just behind, were purchased for a song at an end of season last autumn and are proving appreciative of our heavy soil. Although I could have planted many more narcissi last autumn, I am happy that I did at least plant in drifts of no fewer than 50 bulbs. Even in a small garden bigger drifts help avoid the bittiness to which I am prone. They balance nicely with the big splashes of colour delivered by Magnolia x soulangeana and Kerria japonica ‘Pleniflora’. I deliberately avoided taller varieties, selecting smaller ones such as N. ‘Jack Snipe’ ans ‘Sailboat’ that would not look out of proportion in an enclosed space. Camassias, fritillarias and tulips will continue the display later into the spring and are just beginning to emerge. Every day now there is a new bud, a first flower or a tender seedling to look out for….. and the weeds won’t be far behind them. You really have to go round the garden every day just now, it is all happening so fast. 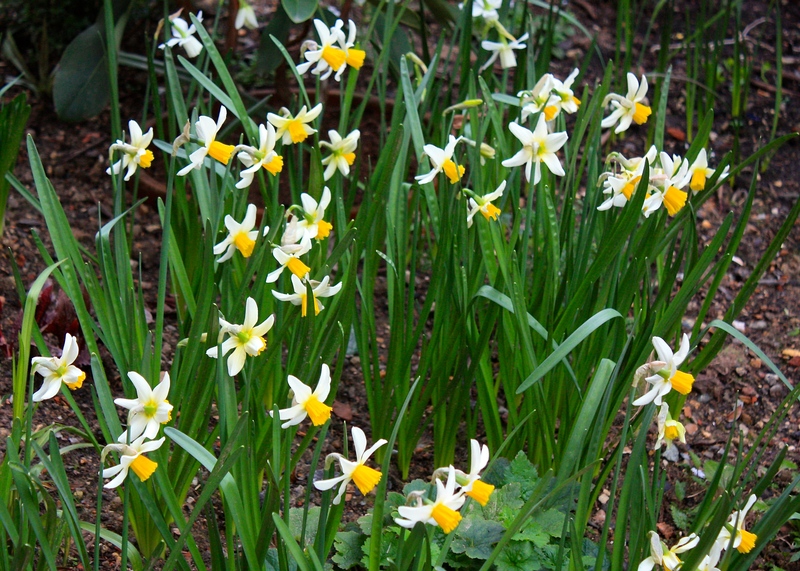 You are right about planting narcissi in drifts of one variety. A previous owner here planted our orchard with hundreds of daffodils and it would have looked amazing if they had all been the same.. As it is they are not even the same height. Lots of horrible doubles and all different.Such a pity. That is a pity. I can’t bear to uproot anything, but sometimes one has to be brave. I find those big sacks of gigantic mixed daffs a bit of a turn off whenever I see them in the garden centre. I like my daffodils to look as naturalistic as possible, especially in grass. Perhaps cut them and give them to your friends? Thank you Ben, and the same to you! May your garden grow. It’s almost as good as the run up to Christmas, so exciting to see what you’ve got and what you’ve forgot!